Technically all electric devices are set to have sleep mode duration. This happens while the device isn’t in use or idle. The beneficial part of this one saves on battery and avoids waste of internet in matters concerning router. The process also works to save the electricity which is heavily consumed later causing high electricity bills. 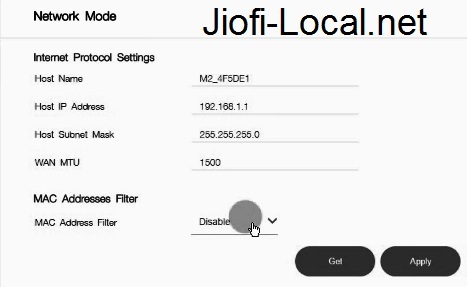 In the case of Jiofi personal hotspot router, the device has different setting to get to the sleep mode. The router function to distribute network to different devices either indoors or outdoors. This being one of the smart appliances from the reliance Jio company. It easier to control and adjust the Jiofi sleep mode to what suits you. New users might strain in getting the jiofi sleep mode settings. Though in this article we focus in getting the process done. Follow the given guidelines below and there you can set your Jiofi device. Taking the Jiofi Dongle router, switch on by pressing the power button. Now use the device to connect to the computer or other smart device. Go to the web browser and enter the link which will lead you to the homepage. Here enter the password and username by given administrator as the answer to both slots. Now login to the account and select the network configuration. From the menu bar check for the sleep mode details. Click on the sleep mode and form here select the option of your choice. The boxes are indicated about disable sleep mode or enable the sleep mode. On choosing the Jiofi Router sleep mode now select time as per preference. Save all the details indicated on the screen. A message will be displayed giving information about the device being intermittent. This will cause it to reboot in order for the changes to automatically save. Select the ok button and the process is done successfully. Note after the process one should log out form their account to avoid account misuse or hacking. Login out will keep off unauthorized people from getting passwords and username. Note if the device is not in use one shouldn’t shut it down. Saving on powers and also the internet connection. Saves on battery power while the device is not in use. Helps battery live longer as it’s not idly used. The device is automatically set thus shutting or sleeping if one forgets about the router. The setting is simple to apply and don’t require special performances from the computer experts. 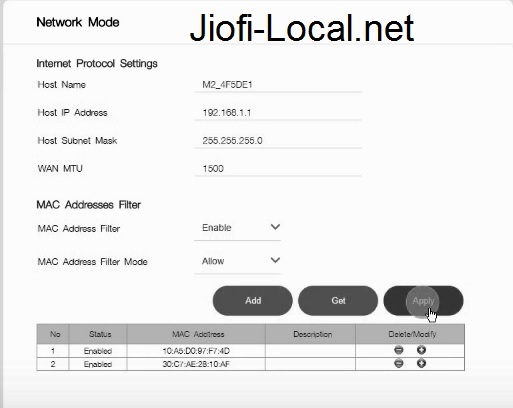 Jiofi Dongle router happens to have different qualities which are client suitable. The devices don’t only have the sleep mode but other features which are unique. It cheap and has quality internet coverage. Believed to hotspot more than 10 devices at the same time, given the praise of better battery and simple settings. The device is also simple and portable. 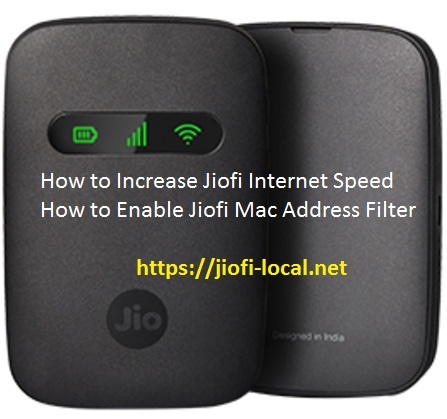 Procedure for How to raise the Jiofi Internet Speed and How to Enable the Jiofi Mac Address Filter option at 192.168.l.l and jiofi.local.html….. Create a Wireless Encryption Password to make sure that only you and authorized user can access this connection. It you set it to open, it will be used by other people and cause decreased speeds. Make sure that the DNS is changed to Open DNS i.e. 208.67.220.220 or 208.67.222.222. You could also opt for Google DNS, whose IP address is 8.8.8.8 and 4.2.2.2.2. Those are the Google DNS servers. Consider placing the device close to the windows or any other open areas instead of placing it very close inside your room. This makes sure that it can easily connect to the network. Click on the Network tab and choose the ‘Mac Address Filter’ option. Enable the Mac address filter. Click on the Submit button. Keep the setting by tapping on “Apply” button. Jiofi has led to creativity and new innovations in the electronics sector of the industry. Usability has immensely increased and the size has been reduced leading to an innovative union. Due to its never-ending features, Jiofi has a great potential to serve a lot of users. Explore it today! Make sure that your WIFI security is set to ‘WPA-PSK/WPA2-PSK’. Also, the ‘Wireless encryption type’ must be set to ‘AES+TKIP’. Hit the security key placeholder and enter your desired password. Being the first nonprofit, 0 INR costing 4G Network had set to have created the history. The Reliance company was just right to focus on the broadband services, rich applications, and affordable smartphones as this integrated strategy have landed them today in this arena. Today, Jio has its major foot in high-speed data, telecom, digital commerce, mass and media, payment gateways and what not!